We all know the story about the high school kid, who waits for his father to go out of town, and takes his classic car for a spin. The result? A dented fender and missing hubcaps. Classic cars are an amazing reminder of the past, and often they are so cherished not for the speed or the design, but because they conjure, in the owner, a time in their lives when they were young and free. Cars are the most nostalgia memories of our youth, and that is why they are so beloved. The classic car market has exploded over the past two decades. As restoration techniques begin to improve, it is becoming more reasonable to restore any old junker and bring it back to life. A real booming industry, they aren’t cheap. Classic cars can run from the thousand range all the way up to millions. The one thing that they have in common is their uniqueness. If you get into a crash, these cars can’t just be replaced on the floor of some auto dealership. Classic cars were made long ago but bought back to life, with care and some real time intense work. That is why it is a wonder that auto insurance rates for these gems don’t empty your pocketbook. If you are staying away from purchasing a classic car because you think that the insurance payment would only further make them unreasonable, you may want to look again. Insurance rates, to insure classic cars (of course that depends on the model), may not be any more expensive than that BMW parked in your garage. In fact, they may not be any more than that late 20’s sedan. There are many reasons insurers are willing to relax the price on local car insurance. The first is that many classic car owners don’t use it for their primary transportation. Taking special care with their babies, they often don’t take them out in inclement weather, or very frequently at all. Classic cars aren’t the first choice to make the trek to work every morning; they are more for a Sunday afternoon drive through the country. The problem is that if you want to receive special discounts on your classic beauty, then often it may take some legwork on your part but in the age of technology, it is much easier to sign on and sign up for your insurance needs. When, and if you do that, however, you may be missing out on special offers that many car insurers have. If you want to find the special discounts, you have to take the time to pick up the phone. A plethora of deals and breaks are available to decrease your premium if you are willing just to take the time to ask. Just because a car is old and restored, that also does not mean that it is technically a classic car in the eyes of an insurer. There are very precise definitions about what is classic and what is not defined individually by different carriers. A classic automobile has to be between ten and forty years old and been taken special care to be in its original condition, according to its manufacturer. 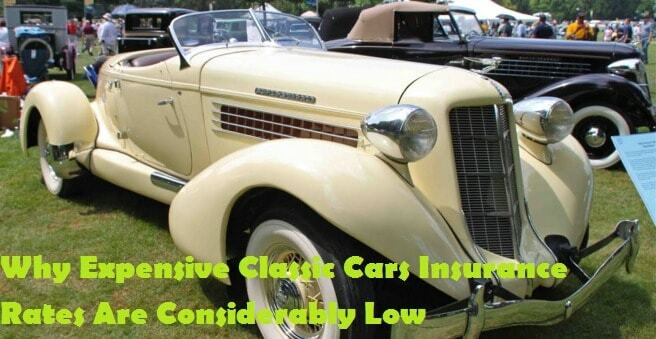 It may also be the case that one insurer will classify a car as classic while another may not. There is no standardization from state to state, or even insurance carrier to insurance carrier about what is classic and what is not. The general rules are that antique cars are at least twenty-five years old and have all the original manufacturers parts. There are exceptions to the rule, however, but that is up to the individual car insurer. There is also a special classification for those cars that have been restored from as early as 1919. Often, they are considered “vintage” cars, not classic cars, because, for necessity’s sake, they have had to be modified to be drivable on today’s road systems. The key to getting a cheap insurance rate is to use a company that will have a special allowance, not for the price of the car, but consideration to the amount that the car will be operational. It is also important to find a carrier that knows the owner of a classic car is characteristically very different from someone who owns a new Maserati.